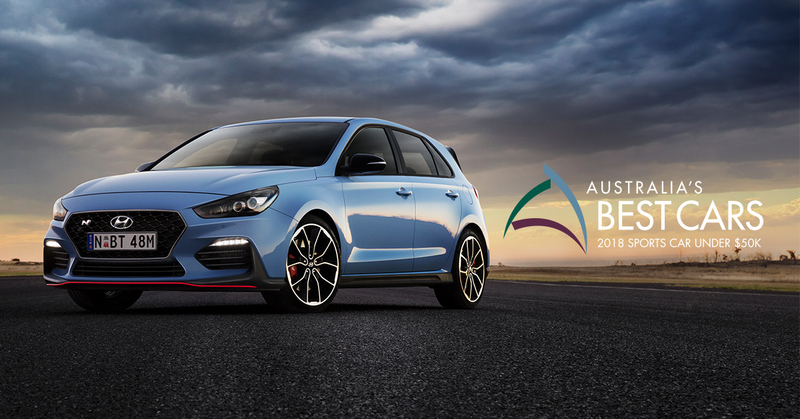 21 June 2018, Hyundais game-changing i30 N hot hatch has been crowned best Sports Car Under $50,000 in the 2018 Australias Best Cars awards, marking Hyundais 23rd victory in the long-running programme run by Australia's national motoring clubs. The i30 N secured the coveted title against established hard-hitting high-performance players, in the nations largest independent new-car assessment and awards programme, after a gruelling week-long test adjudicated by representatives from Australias peak motoring organisations. The i30 N won the judges votes with its accessible high-performance, hugely capable and rewarding handling, all-rounder practicality and value for money, against tough competition from shortlisted category rivals. The i30 N also impressed the judges with its class-leading five-year/unlimited kilometre new-car warranty, which extends to casual track day driving. In securing the sought-after Sports under $50K category title, the i30 N rose to an intense challenge from Ford Focus St and Ford Fiesta ST.
Australias Best Cars judges commented: With a starting price of $39,990 there are few in the category that can match the i30 N price-wise and the value-for-money equation is enhanced with a good level of standard features and high build quality. Impressive as it is, you do not win a sports category with those attributes alone and it is the i30 Ns on-road scores that really matter and where it excels. We are immensely proud of the i30 Ns Australias Best Cars victory, which comes just three months after its critically acclaimed arrival in Australia, Hyundai Motor Company Australia CEO J.W. Lee said. The ABC award closely follows the i30 Ns victory in Wheels Magazines 2018 Hot Hatch MegaTest against 11 of the most capable compact high-performance cars on sale, underlining the unique blend of driver focus and value for money offered in our first N Performance Division product. The $39,990 i30 N delivers compelling hot-hatch performance developed in Korea at Hyundais Namyang R&D centre, honed at Germanys infamous Nurburgring and with a chassis tuned in Australia to meet the demands of our unique conditions.